The rules are so friendly! Rules is available online (you may have to navigate the forums and track it down) as Dion bought a german copy. Apparently all the english copies were all sold out on the first day! They are fairly easy to go through and quite well laid out. Bravo! With that we could easily get into the game. At its heart, it is a worker placement game. Your player board is your technology tree per say with different ways too score points at the end of each round. There is a main board where you will be placing workers and that is where the main player interaction will occur. There are 7 rounds in a game and during each round, players will take turns placing a worker (or workers) on an available action space and immediately perform the action. Players may also pass and once all players have passed, we proceed to end of round scoring and adjust the player order track and we go again. There are end of game scoring but that depends if you managed to get the end game scoring cards. Components wise, its your standard euro-style game quality. Though Dion mentioned that he was missing several meeples which seems to be quite a glaring oversight. I am not too sure if its just his copy though. Art wise its very good. Iconography is clear and easily understood so its helps with the learning curve. There are MANY MANY ways to score points in the game and indeed you are expected to score a lot of points. Apparently the average score is 300 and judging from our first game, that is to be expected. Jon commented that this felt like Stephen Feld and I agree. Everything you do is either helping to get points immediately, for end of round scoring or for end of the game scoring. How did it play ? We played 4 for our first game and, as Jon mentioned, it seems that the default move that you as a first player should make is to go after the Engineers. In the game there are engineers available for hire or to activate. These allow a player to have his/her own stash of engineers when purchased which provides him/her another action space to activate. In addition having the most engineers at the end of the game awards you a whopping 40 points! So it will be quite silly if you did not try for that. Problem is, once there is someone with the majority, it becomes silly to also compete for it but at the same time you cannot ignore because it gives you an additional action space which is usually more beneficial than what the board can offer. As the game progressed, I decided to just get more workers first because in most worker placement games, getting more workers is usually the key. Besides, there is no need to feed (unlike Tzolk'in or Agricola) the workers so no worries when getting more workers. Thus i focused on the bottom most railroad track which seems to allow me to easily get my first worker. That track also awards you quite a lot of end of round scoring points which I felt was what will keep me in the game. Jon joined me on this track after the first round or two and soon we were scoring at least 20 points from it per round. That counts for almost 100 points after 7 rounds so we are 1/3 of the way there. There are some player interaction points in the game but if you are more flexible enough, there are usually enough spaces on the board for you to perform other actions so its advisable to have a 2 prong strategy in your game. The most obvious interaction point is on the game board where spaces you really wanted are taken earlier by another player and you maybe forced to use 1 more worker to obtain the same effect. The second would be the trains/factories supply. The trains are separated between 1 to 9 (indicating the number of spaces on the rails they can reach) and they are in limited quantities. 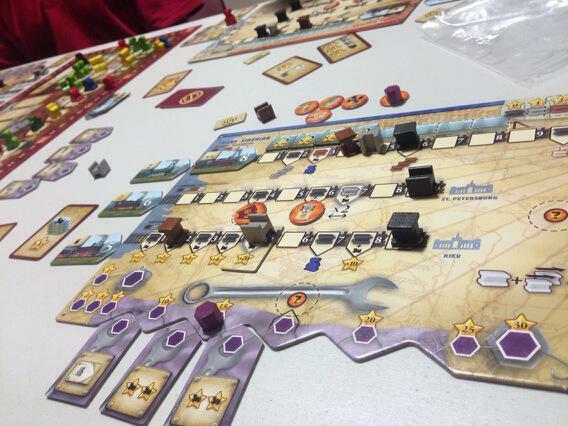 Thus you may want to grab a train during your turn, but are you setting up another player to get the larger number train because you took the last one? Other than that though, there is not much interaction. You cannot directly impact another player's board nor can you block routes so its pretty much how fast you can take away someone's option. During the game though I wasn't too focused on what the other player's were doing and was just trying to do my own thing and adapting to the board if the spot i wanted was taken. Did I mention that in this game you will be scoring a lot of points? By midway through the game, most of us were scoring 40+ points every round which feels a little crazy. I mean the game seems to be a medium weight euro, tending only slightly on heavy yet we are scoring so many points? Also you have to be careful when scoring points. Because of the amount of items on your board that can score points, chances are you may miscount so you have to be aware. In summary from our first play, it is a medium weight worker placement game. Art is great, components are standard and we had fun. I would certainly like to try it again and try different strategies but as Jon and I discussed later, there may not be as many strategies as we had hoped. It seems the most random aspect of the game would be from the order that the engineers appear available for us to use/hire. Otherwise everything else will be dependant on the strategies that the other players utilize. I can certainly see why its a hotness at Essen but I will certainly want to play a few more to see if this will rise to the top in my list. Try it if you have the chance!